Are pre-school children scarier than being in debt ? I received a very expensive hug from Toddler this morning. He was overenthusiastic and uncontrolled, his arm hit my eye and PING out went my contact lens to the further reaches of the bedroom. Twenty minutes of searching and nothing, left Husband carrying out a fingertip search of the bedroom, and I was late for work. That horrid constricted feeling is back in my gut. It’s not the money though. Yes getting the car fixed did cost more than initially anticipated, (much much more L). But I had this feeling on Sunday night and didn’t know about the car until Monday morning. So either I am allergic to beer (unlikely, as I split a bottle of Bombadier with Husband Sunday night), or…the thought of having a Halloween party for small children is haunting me ! My nice neighbour, the Flapjack Queen reassures me that its going to be a small affair. Food does not need to be elaborate as after all 3 year olds are not as harsh critics as 4 year olds. 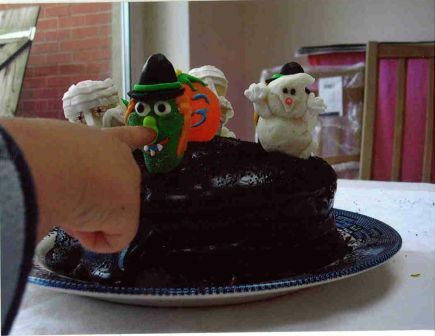 So the menu is biscuits cut in Halloween designs, orange jelly pumpkins, sandwitches, crisps, melon monster eyeballs, possibly pizza and the monster cake, by special request from Toddler who remembers it from last year… may need to be a bit creative as can’t find the lollipops. M&S only have chocolate lollipops, John Lewis has some great characters on top of rice crispy clusters but at £1.50 a pop, so that’s not an option. Still have that tense feeling…I think its fear of letting the Toddler down…his Mummy is making a cake for his friends…can I measure up to his requirements ? Despite my comments earlier in the week about how much I love the Autumn, I must confess to being a little down, or rather a lot down, it was an indigo day in fact. I am suffering from a lot of stress and tension related to our financial situation. Because, although having returned to full time employment as of the 1st October our human resources department still has not completed the paperwork. Furthermore unless they do it by the beginning of November then the chances are that I’m not going to feel the benefit of the extra days pay until the middle of December. In order to meet bills we are having to watch our finances very carefully. I am running out of places I can save money, other than food that is and we’ve never really wasted that. Anyway, today I feel the hole we are in, I feel it in my whole body. I feel blocked, I feel constrained and I feel it in my gut, in my belly, in my intestines and my bowels. It is a taut string running from the top to the bottom and it cripples me, I can’t think and therefore I can’t work. Food in the house the last few weeks has been very much comfort food. Husband has been serving up big bowls of pasta, tomatoes and cheese or sausage and mash. A bag of pudding rice has appeared. The Atkins diet has no place in this household, its carbohydrates all the way. Tonight I need something simpler though, something my gut can deal with, that will cheer me up and comfort at the same time, something that looks happy in the bowl. Coincidently my kitchen has been dominated by the presence of a very large pumpkin, hoping to end its days as something more than a lantern on the 31st… I also have some cream that needs using, as do most of my spices which spent 6 months in storage during the house works. I follow vaguely a Nigel Slater recipe for pumpkin soup, which can be found here but is also in Real Good Food which is a book compiled from early articles from Nigel’s Observer columns. This incidently is one of my earliest cookbooks. The soup recipe was possibly one of the reasons I bought the book (that and his description of BBQing sweetcorn). Hopefully, the remains of it will do for lunch for what’s left of this week…when my mind needs soothing I cook cake, when its my body that is in crisis I need more than sugars. postscript The lovely Mrs Zee with whom I work has found a human in the cyber department our human resources has become and has persuaded them to press the right buttons on the computer so that I get paid the right amounts in November, even if the paperwork follows later. My Nana passed away earlier this year, at Easter. Had she lived then today (15th October) would have been her 100th Birthday. Coincidentally had my Grandma lived, then today would have been her 106th birthday (she died the christmas before her 100th birthday). Now, my Nana was a fantastic cake baker, she had a real talent for cake decoration. I’m told that she was still a pretty mean decorator even after she had a stroke (20years ago) and despite being paralysed down most of her right side managed to teach herself to do most things with her left ! Pickled onions didn’t seem right as a memorial, so I used the sponge recipe as a basis and made a Coffee and Walnut cake instead because Nana loved Walnut Whips. I remember once, at about the age of 10 buying her a packet of 3 walnut whips as a christmas present – it was the same year that I bought Dad a packet of McVites Digestives (50p pocket money still didn’t go very far in the early 80’s, and we didn’t have that extensive a choice of biscuits). * preheat oven to 180 deg C. Grease and flour (and line if you want to) 2 sponge tins of approx 18-20cm diameter. 2. Add 1 egg and a little flour to the sugar/butter mixture, mix until well combined. Do the same for each of the other 2 eggs. 3 Add in some of the coffee flavouring. Mix until well combined. Then sieve in any remaining flour. Beat well until combined. Taste the mixture, add more coffee if you like a stronger flavour. At this point add walnuts if using and combine well. A coffee flavoured butter cream is traditional and is what I would normally use. Smooth half in the middle and then the rest on top, decorate as you see fit with chopped walnuts (can provide a butter cream recipe if needed). Butter cream however makes my Dad feel ill, so I’ve tried a variation in the hope that it won’t upset his stomach. 5 Sift the icing sugar into a bowl and set aside. Dissolve coffee in 2 tbs boiling water. 6 Put butter in saucepan and melt over gentle heat. Let it bubble slightly (no more than 3 minutes or until it turns a light gold brown) – if you are lucky you should smell a smell reminiscent of butterscotch. 7 Add the butter to the icing and then quickly the dissolved coffee, and finally the cream. Beat all the ingredients together in the bowl until the icing is shiny and smooth. Leave the icing to one side for 20-30 minutes to thicken slightly. 8 Spread some of the mixture on the top of one of the sponges. Place the other sponge on top and spread the remaining icing over the top and sides. Decorate with any bits of walnut you happen to have in your cupboard. Postscript A quick google brings to light the fact that you cannot get coffee flavoured walnut whips anymore – however it does appear that they were first produced in 1910 which I guess is as near to Nana’s birthday as I’m going to get !